A heart attack is a life-threatening emergency condition. Heart attack, medically termed myocardial infarction (MI), is the leading cause of death for men and women. A heart attack occurs when the heart muscle does not receive enough oxygenated blood and the heart cannot function. An ambulance should be called immediately if a heart attack is suspected. Symptoms of a heart attack include pain or pressure in the center of the chest, shortness of breath, nausea, vomiting, and pain that radiates from the chest into the teeth, jaws, shoulders, or arms. A heart attack can be fatal. Immediate emergency medical care is necessary to sustain life and prevent medical complications. The heart is the core of the cardiovascular system. Your heart is located to the left of the center of your chest. It is about the size of your fist. The heart is a muscle that pumps blood throughout your body. The blood carries oxygen-rich blood that your body cells need for energy. Your heart contains four chambers. The chambers are separated by the septum, a thick muscle wall. There are two chambers on each side of your heart. The top chambers are called atria, and they receive blood. The bottom chambers are called ventricles, and they send blood. Your heart contains a right and left pumping system. Your left atrium receives oxygenated blood from the lungs, and your left ventricle sends it out to your body. Your right atrium receives deoxygenated blood from your body, and your right ventricle sends it to your lungs. Four heart valves prevent the blood from back flowing as the blood moves forward through the heart chambers. The mitral valve and the tricuspid valve regulate blood flow from the atria to the ventricles. The aortic valve and the pulmonary valve control blood as it leaves the heart. The first sound of your heartbeat is from the mitral valve and the tricuspid valve closing. The second sound in your heartbeat occurs when the aortic valve and the pulmonary valve close after the blood leaves your heart. Arteries are blood vessels that carry oxygenated blood away from your heart. The aorta is the largest blood vessel in your body. The aortic valve separates the left ventricle from the aorta. The coronary arteries branch off of the aorta and supply the heart with oxygen, blood, and nutrients to keep it healthy. The pulmonary artery carries deoxygenated blood from the right ventricle to the lungs. Veins are vessels that carry blood from your body and lungs back to your heart. Your two largest veins are the superior and inferior vena cavae. They are located above and below your heart. The large arteries and veins surrounding the heart branch out and become smaller throughout your body. Small capillaries connect the arteries and veins. Capillaries deliver oxygen and nutrients to all of the cells in your body. They also remove waste products, such as carbon dioxide. A heart attack occurs when the heart muscle cells die or are damaged because they do not receive enough oxygen. Clots that block the coronary arteries cause the majority of heart attacks. The most common cause of clots is atherosclerosis. 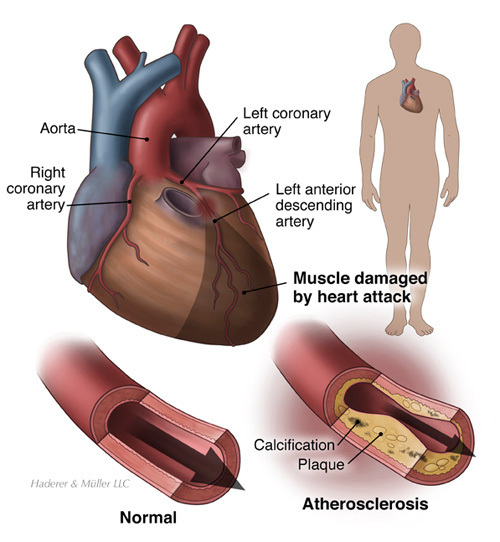 Atherosclerosis is a disorder that causes plaque build up and hardening of the arteries. As the arteries harden and thicken, blood does not flow efficiently. The plaque build up inside the arteries can crack and trigger blood clot formation. A clot in the coronary artery blocks the blood flow to the heart muscle and causes cell death. When the cells in an area of heart muscle die, they form a collagen scar. The scar tissue does not have the ability to contract and causes the heart to become permanently weaker. Other heart muscles try to compensate for the damaged tissue. This can cause a fast heart rate that stops the heart from pumping blood. The decreased output of oxygenated blood and decreased blood pressure can result in a heart attack or death. Heart attacks can also result from extreme stress or exertion, especially if it is extremely more than normal for that person. The illegal drug cocaine is another cause of heart attack. Cocaine can cause the coronary arteries to spasm. Additionally, sudden severe infections, such as pneumonia, can trigger a heart attack. A heart attack is a life or death medical emergency. You should call the emergency medical services in your area, usually 911, if you or someone else experiences one or more signs of a heart attack. A heart attack can be fatal, and receiving emergency medical treatment as soon as possible is vital for sustaining life. The more time that passes before a person receives emergency treatment, the more likely a person is to experience permanent heart damage or death. Some heart attacks occur suddenly and intensely. Others may start out slowly. A heart attack can cause chest pain, pressure, squeezing, fullness, or pain that lasts for more than a few minutes. The chest discomfort may come and go. It may feel like you have bad indigestion, a tight band around your chest, or that “an elephant is sitting on your chest.” You may experience pain that radiates to your jaws, neck, shoulder, teeth, arms, back, or abdomen. A heart attack can cause shortness of breath, nausea, vomiting, lightheadedness, nausea, and a cold sweat. Women and men may experience different symptoms of a heart attack. For both men and women, chest discomfort is the most common symptom of a heart attack. However, women are more likely than men to experience back or jaw pain, overwhelming fatigue, dizziness, nausea, vomiting, and shortness of breath. A doctor can begin to determine that you are having a heart attack based on your symptoms and physical examination. Signs of a heart attack include a fast pulse, abnormal heart sounds, and abnormal lung sounds. Your blood pressure may be high, low, or normal. Blood tests may indicate substances that are associated with a heart attack. There are several tests that can help to identify a heart attack and the extent of damage. Common tests include an electrocardiogram (ECG), echocardiogram, coronary angiography, and nuclear ventriculography (MUGA or RNV). An ECG records the heart’s electrical activity. An ECG may be repeated over several hours. An echocardiogram uses sound waves to produce an image of the heart on a monitor. A dye and X-ray are used to show an image of the heart and its arteries with a coronary angiography. A nuclear ventriculography involves using a safe radioisotope injection to produce an image of the heart with special scanners. A heart attack is a life and death medical emergency. You should call the emergency medical services in your area, usually 911, if you or someone else experiences one or more signs of a heart attack. Receiving emergency medical treatment as soon as possible is vital for sustaining life. You should not drive yourself to the hospital if you suspect that you are having a heart attack. Instead, call emergency medical services for an ambulance. After contacting emergency medical services, you can help a person that is having a heart attack breathe easier by helping the person to a restful position. A half-sitting position may be helpful. You should increase the flow of oxygen to a person by loosening his or her collar and opening a window. If the person has prescription nitroglycerin, have the person place it beneath his or her tongue. If the person is not allergic to aspirin, give the person 160-320 mg. of aspirin, which they should chew. Aspirin helps to prevent blood clotting. Monitor the person’s pulse, heart rate, breathing, level of consciousness, and if possible, blood pressure. If the person’s heart stops, administer cardiopulmonary resuscitation (CPR) if you are trained to do so. The goals of ambulance and emergency room treatments are to stop the progression of the heart attack, promote healing, and prevent complications. A person’s heart is continuously monitored with an ECG. Medications and fluids are delivered through an intravenous (IV) line. Medication may be administered to reduce pain, thin the blood, reduce the workload of the heart, and prevent heart failure. Oxygen is provided to reduce the workload of the heart. A urinary catheter is used to measure urine output. If a person’s heart stops beating, the medical personnel can perform CPR. They can also use automatic external defibrillation (AED). An AED may correct an irregular heart rhythm or restart a heart that has stopped beating. More and more AEDs are being located in public places, such as school gyms, for quick access. Early advanced medical care is necessary for an optimal outcome. People are usually monitored in the intensive care unit (ICU) of a hospital while their medical condition stabilizes. In some cases, emergency surgery may be required. A coronary angioplasty is a procedure that opens blocked coronary arteries. A stent may be inserted to ensure that the coronary artery remains open. Coronary artery bypass surgery (CABG) is a surgery which involves taking a blood vessel from another part of the body to create a detour around a clogged artery to restore the blood flow to the heart. 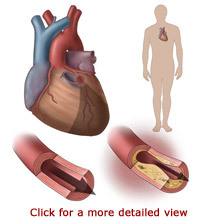 Blood vessels are commonly taken from the leg and surgically attached to the coronary artery. It may be necessary to have bypass surgery on one or more coronary arteries. Your activity level may be restricted for a few months following a heart attack. Your doctor may order tests to learn more about the condition of your heart and identify treatable causes. You will gradually increase your activity level with cardiac rehabilitation therapy. You should make lifestyle changes to keep your heart healthy. This may include maintaining a healthy weight, not smoking, avoiding alcohol, eating healthy foods, and regular aerobic exercise. You should take all of your medications as directed. Follow up care is necessary to prevent a second heart attack and associated medical complications. Know the warning signs of a heart attack and know what to do if one occurs. Contact emergency medical services immediately if a heart attack is suspected. Learn CPR to help others. Know your risk factors for a heart attack. You may decrease your risk of a heart attack by correcting the risk factors that you can control. Do not smoke or take illegal drugs. Avoid alcohol. Monitor your blood pressure, cholesterol, and diabetes. Eat healthy and maintain an appropriate weight. A nutritionist can help you plan a heart healthy diet. Get regular aerobic exercise. Ask your doctor if preventative aspirin medication is appropriate for you. Risk factors may increase your likelihood of a heart attack, although some people that experience a heart attack do not have any risk factors. People with all of the risk factors may never develop a heart attack; however, the likelihood increases with the more risk factors you have. 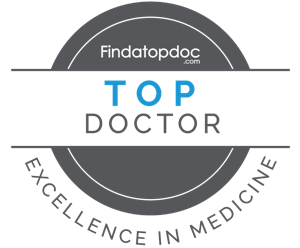 You should tell your doctor about your risk factors and discuss your concerns. _____ Being overweight increases the risk of damage to your heart and arteries. _____ High blood pressure increases your risk for a heart attack. _____ High cholesterol increases your risk of a heart attack. _____ Diabetes damages your blood vessels when your blood sugar levels are out of control. _____ Smoking narrows your blood vessels; it increases your risk of dying from heart disease. _____ Men have a higher risk of heart disease after age 45. _____ Women have a higher risk of heart disease after age 55. _____ African Americans and Hispanics have a greater risk for high blood pressure and heart disease. _____ Heart disease can run in families. If your grandparents, parents, brothers, or sisters have heart disease, then your risk is increased. _____ Illegal drug use, such as cocaine or methamphetamine, increases your risk of heart attack. A heart attack is a life threatening medical emergency. A heart attack can cause death. Minutes matter. Contact emergency medical services immediately if you suspect that you or someone else is experiencing a heart attack. The longer a person waits to contact emergency medical services, the more likely the person is to develop life threatening arrhythmias (irregular heartbeats), severe permanent heart damage, or death. If you have experienced a heart attack, make and attend all of your follow up appointments. Good follow up care is necessary to help prevent a second heart attack or medical complications. It is also important to take all prescribed medications after a heart attack until instructed to stop by your doctor. Medical complications associated with heart attack include irregular heartbeats, congestive heart failure, heart inflammation, and blood clots. Researchers are examining the association between certain blood components, viruses, and bacteria and heart attack. Doctors hope to use this information to help prevent heart attacks and better identify people at risk for a heart attack. Public health campaigns are educating the public about the importance of healthy eating habits and exercise to prevent heart disease.